Korg's latest keyboard blurs the boundaries between their affordable 'Micro' range and their pro workstations. The Microstation is the latest addition to Korg's 'Micro' range, and to their illustrious line of synth workstations. 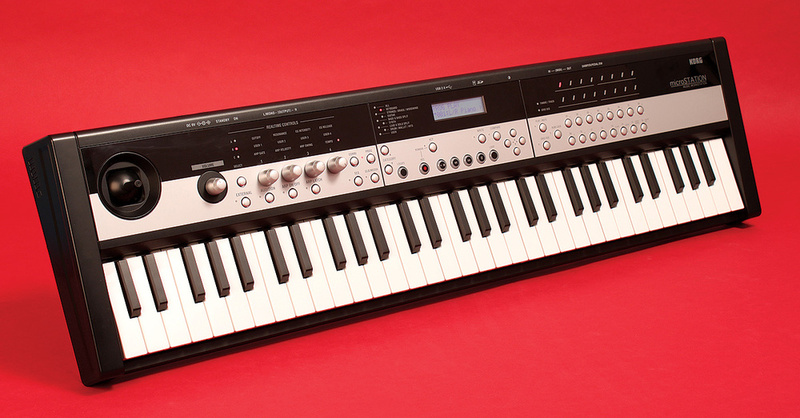 Indeed, much of the Microstation's functionality echoes Korg's impressive M50 — but at around half the price! Of course, not even Korg can shrink an already trimmed‑down instrument without some pain. Leaving aside the externals for a moment, the first twinge isn't visibly obvious: in place of the M50's 256MB of wave ROM, the Microstation has just 49MB to play with. The second wince comes when you peer at the two‑line display and realise that any task beyond a spot of superficial editing won't be fun. Fortunately, this criticism will be negated for many users by the inclusion of free editor software. The Microstation's tale isn't all about economy and reduction. Its sequencer — a vital workstation component — comes close to that of the M50, on paper at least. And when it comes to the all‑important polyphony round up, the new boy squares up with an unexpected 120 voices, exceeding its larger sibling by 40 voices! Therefore, if you salivated over the M50's plush Korgness but your budget didn't match your appetite, or if you preferred something significantly smaller and lighter, the Microstation could be the OASYS spin-off you've been waiting for. The Microstation's back panel features a single pedal input, MIDI I/O, a contrast control for the front panel LCD, an SD Card slot, a USB 2 port, stereo quarter‑inch jack outputs and a socket for the external 9V power supply. I don't think the adjectives 'substantial' or 'rugged' will be on the tips of many tongues seeking to describe this vision in black and silver plastic. Highly portable, at less than 3kg, the Microstation's 778 x 210 x 82mm frame has a thin, almost stretched appearance. Perhaps this impression is due to the different scaling of various components. The sprung joystick is of healthy, unrestricted proportions but this simply draws your attention to the tiny grey buttons and stubby keys that make up the longest mini-key keyboard I've seen. Having already questioned the value of mini keys in previous reviews, I won't deny the keyboard action is fast and pleasantly springy. If you're prepared to put in the effort, I'm sure average‑sized fingers can adapt to it. However, extending this to 61 keys invites the notion of two‑handed playing, which presents a fresh level of difficulty. I couldn't reliably sense the position of notes I was aiming for, so my only hope was to evolve chameleon eyes able to follow each hand independently. These, sadly, failed to materialise, and I therefore plugged in an external keyboard to reduce my inadvertent exploration of weird jazz scales. Like the M50 before it, a single pair of audio outputs on the Microstation are your route to the outside world. At first it looked as though there was no headphone socket, until I spotted the small mini‑jack tucked away at the front left-hand side of the keyboard. Economising on control pedal inputs, only one is provided; it's your choice whether to use this for a sustain pedal, assignable switch or expression-pedal duties. MIDI is available via the traditional five‑pin In and Out sockets (no Thru) and also bi‑directionally via the USB 2 port — that nifty connection to a PC or Mac. Speedy external backup is provided by an SD/SDHC card slot, which you'll definitely need if you intend to work extensively with the onboard sequencer (its contents are lost on power down). The manual mentions 2GB as the capacity recognised, although I hope this isn't an absolute because, as such storage cards become perceived to be 'small', their use will decline and they'll be harder to source. Power arrives courtesy of an external adaptor. The Microstation's front panel measures just 778 x 210mm — all thanks to its 61‑note mini-key keyboard. The Enhanced Definition Synthesis sound engine (or EDSi — we'll look at the 'i' part later) is sweet on the ears, if a mouthful to say. Much of the structure is directly comparable to the M50, so to avoid needless repetition, a perusal of that synth's October 2008 SOS review should bring it all flooding back. Essentially, we're in the realm of Sample & Synthesis, built, in this case, on 49MB of wave memory. This raw material is processed by rather decent‑sounding dual multi-mode filters then mucked about with — first by a highly flexible modulation system and later by an armoury of effects. Layer a few patches, throw in two programmable arpeggiators, and even the more cerebral sound designer might be pleasantly surprised. Although I offered the M50 review as a refresher, a direct sonic comparison would be rather unfair. The Microstation isn't poorly supplied, though and its 360 multisamples and 484 drum samples (24 of which are stereo) pack in a good representation of Korg's original workstation concept. This means: luxurious strings, pads and choirs to lose yourself in, some seriously solid basses (both synthetic and acoustic) and drums sufficient for most occasions. In answer to the popular question 'what are its pianos like? ', the acoustic pianos are certainly playable and delightfully plinky at the top end, especially when played from an external weighted keyboard. The current factory set doesn't skimp on electric pianos and organs but one patch bank is empty, or 'ready for you to populate', as the sales blurb might put it. Personally, I'd have welcomed a few more ethnic and dance patches but, all things considered, you get a solid, if unadventurous, collection to get started with. Incidentally, it was round about now that I noticed the lack of transpose knobs; if you want to shift the keyboard, say for that extra octave of bass, you need to head for the Global/Transpose menu. Cementing its kinship with Korg workstations through the years, the Microstation operates in one of three modes: program, combination or sequencer. With up to 512 user programs, 384 combinations and 48 drum kits and with 256 GM2 presets thrown in to dazzle your granny, it's fortunate there's an effective category search. With this, you can narrow down patch selection to guitars, bass, synth and so on, or, for direct numerical selection, go straight to the buttons at the right-hand side of the panel. It's when you begin to layer patches in combinations that you arrive at the Microstation's sweet spot. There's enough polyphony to really go to town, as some of the factory combis demonstrate. Many of these feature Korg's trademark pads underneath an echoing arpeggio all served in a bed of reverb. Trigger a drum pattern from some of the lower keys and you're in the realm of interactive backing tracks. There are over 500 arpeggio and drum patterns pre‑loaded, with unused space for even more. Editing a pattern requires that you turn to the computer editor. I guess it would have been quite challenging to exploit the subtleties of polyphonic arpeggiation otherwise. Workstations don't typically go overboard on performance controls, so the inclusion of four multi-function knobs is actually a pleasant surprise. These knobs don't assist with navigation or editing, but for direct access to key parameters such as filter cutoff, resonance, envelope amount and release, they're ideal. Push a button and they switch into user‑programmable roles, so you can tailor them precisely to your needs. Another push and the knobs forget how needy you are and become arpeggiator controls for parameters such as gate time, tempo, and so forth. In common with the M50, there's still one more outing for our overworked knobs — external control. With over 100 external setups to choose from, such as tweaking an Arturia Minimoog's filter or the mixer controls on Ableton Live, those knobs won't know what hit them! By the way, if you happen to find yourself in a music shop surrounded by competing guitar heroes, you may be tempted to try the Audition button. This generates riffs deemed appropriate to the patch selected — so with just one push you can confirm everyone's darkest suspicions about synthesizers making it too easy. Don't do it! Editing via the two-line display isn't great, as I may have hinted once or twice. Korg have tried to make it palatable by adding, for example, little arrows at pertinent parts of the screen. These indicate further screens in various directions, rather like an ancient computer adventure. This, for me, was definitely the operational low point. With no data encoder, you must find your way round and enter values via little grey buttons — jabbing them, holding them down, sometimes accidentally scratching the paint off them (sorry). The manual does its best to supply maps of the many twisty passages, and in time I expect I would find my way around, in much the same way as I once navigated the mazes of Colossal Cave. However, there's no point agonising over this, because Korg provide nice, friendly software eager to do your bidding. It is, without doubt, the optimum way to edit Microstation patches and combinations — and the only way to edit the full majesty of the effects and arpeggiator. The 16-track sequencer (with an extra tempo track) isn't far off matching specs with the M50. It offers up to 128 songs and 210,000 MIDI events, meaning that you'll soon be on the lookout for an SD card to store and retrieve your work. True, you can use a computer and USB for archiving, but it's typically slower and faffier. Plus, if you bring a computer into the picture it's hard to imagine the Microstation's sequencer getting much of a look in. Of all the components, it's arguably the sequencer that suffers the most from small display syndrome. Although the patch-selection buttons are drafted in for track muting and step‑time entry of notes, the interface never feels much better than clunky. Even so, there is a dedicated transport bar, a locate button to take you to a predefined location (by default, the song start) plus a loop button so that you can concentrate on a few bars at a time. Everything else is tucked away under the display. The recording resolution is a healthy 480 pulses per quarter note and you can quantise on record (unlike Logic, I feel compelled to add) or do it later — with swing, if you feel like swinging. I couldn't wholeheartedly recommend this sequencer as a primary workhorse but it can definitely get the job done providing you master the UI. If you don't, Standard MIDI files can be imported, so you might do the hard work on a computer but take the Microstation on the road (carefully). 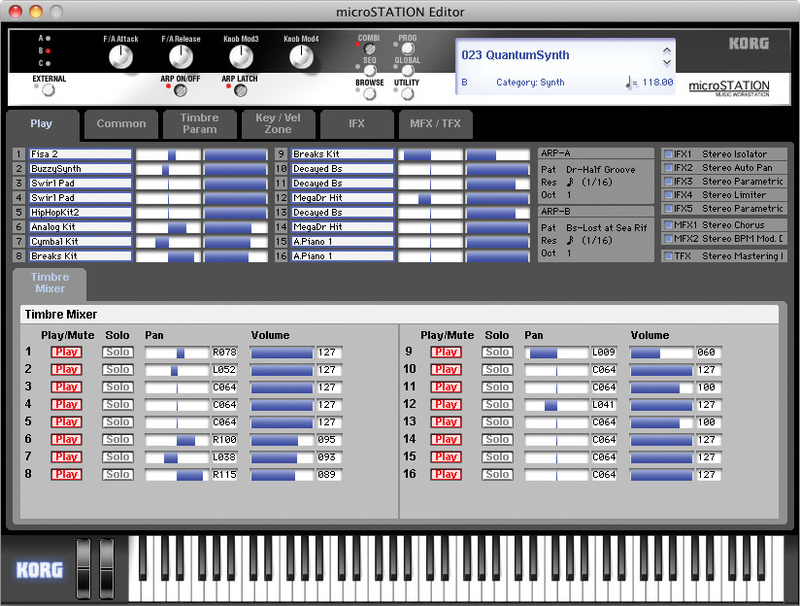 Similarly, sketches made with the sequencer can be exported as SMFs for further development. Doubtless showing my age, I was naively excited by the prospect of Grid entry. Apparently, this mimics the old X0X‑type drum machine programming (it needn't be confined to drums), in which you select a bar and then activate steps within that bar to play. Annoyingly, it transpired that you have to first stop the sequencer before you can begin entering notes, which rather took the fun out of it for me. It's easy enough, though: select a note or drum voice, then activate steps using buttons. In this way, the grid sequencer can be used as a (rather basic) step sequencer. Setting the sequencer to loop requires another stop operation, I'm afraid, but when in loop recording, you may then select new tracks to record without stopping. This is a speedy method of banging in the embryonic ideas that can turn into songs. Tracks can loop independently too, so with a quick drum and bass guideline laid down, you're free to begin overdubbing your latest opus with the minimum of fuss. If you make a mistake, there is a small selection of edit functions. After one of my many keyboard blunders, I needed to go back to isolate and adjust a specific bum note. In the end, I found it easier to use the Remove button to delete the offending note and then replay it. With the screen unable to handle any form of event list, there's no way to provide detailed editing, so it makes sense that Korg didn't try. Holding the Remove and Record buttons deletes all events, and pretty soon I accepted this as faster than editing out mistakes anyway. You can record on a single track — or multiple tracks — and record the actions of the arpeggiators or performance knobs. With oodles of polyphony and a stack of effects, the quality of your Microstation songs might be limited only by your endurance. Korg's Micro range is well established as a source of small, inexpensive instruments that manage to sound like large, expensive ones. It's not hard to grasp their wide appeal, and at least the compromises are plain enough. Miniature keyboards aren't my cup of tea, but with a dose of care and concentration, even I can (mostly) cope with the three-octave versions. However, I strongly recommend trying the Microstation's longer keyboard for yourself, to see whether using both hands over 61 miniature keys is a realistic proposition for you. Every workstation needs a sequencer, and this one is a powerful tool capable of recording entire songs. It's hampered partly by the user interface and partly by the need to stop it to perform basic tasks, but these are irritations rather than terminal criticisms. For song production, and also for the construction of deeply‑layered combinations, the Microstation's high polyphony count and elaborate effects implementation cancel out many of its shortcomings. Ultimately, no matter how good the sequencer or the effects, the synthesizer engine has to deliver the goods. With everything done in the box, there's no room for sonic weakness in any area. Korg have consistently managed to endow their workstations with extra class, and that's certainly the case here. By adding computer integration too, they've made this one Micro that's going to be hard to overlook. 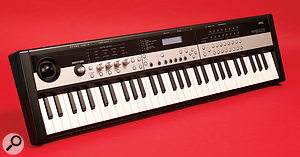 The Microstation doesn't have many direct competitors (unless you consider second‑hand Tritons), but Roland's 128-voice Juno Di is similarly priced and, although not quite a workstation for song production, it can play back a variety of file formats direct from a USB stick (WAV, AIFF, MP3 and Standard MIDI files). The Juno Di is much larger, though, if that's a factor for you, and has full‑sized keys, a PC/Mac editor and 64MB of Wave memory. Its effects implementation doesn't touch the Microstation's, but it has an audio input for external processing such as vocoding, its display is far easier on the eye, and it can run off batteries. Yamaha's MM6 is even cheaper and puts the emphasis on Motif sounds and a decent display and keyboard. Instead of trying to outdo computer sequencing, Yamaha bundle in a copy of Cubase AI4. The MM6's 70MB of ROM waves is promising, but with polyphony at a mere 32 voices, it doesn't fare too well in the direct comparison stakes. 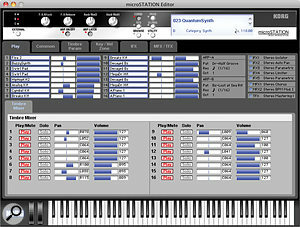 The Microstation Editor runs either in stand‑alone or plug‑in form and supports VST, AU and RTAS formats. Splashed across your screen, this petite workstation's many secrets are laid bare. After waging the usual battle between my studio PC and Korg's USB driver, I turned to the Mac version, which worked like a charm, slotting into Logic like any software synth. Integration in this way allowed the Microstation's finer qualities to shine out unhindered by cosmetics or ergonomics. Played from my master keyboard, its parameters nuzzled by a friendly mouse, this slimline keyboard now slotted seamlessly into my workflow. I even grew to accept the pauses for memory resynchronisation each time a song loaded. Fortunately, the process is pretty fast and if it didn't happen, Logic (or any DAW) couldn't know how many changes had occurred since they last crossed paths. I wouldn't say that this is the most visually welcoming piece of software ever. The fixed window size and smallish text aren't ideal at all screen resolutions, and there's no way to avoid the fact that a heck of a lot of information must be shown somehow. Korg's solution is to use tabs of related pages but, due to the sheer number of parameters, it can still take a while to find your way around. I didn't immediately discover the arpeggiator editor, for example, which eventually turned up in the Global menu (when I was looking for something else). However, this is minor nit‑picking, and in the grand scheme of things the software is truly essential, making light work of all the important editing tasks. Since the workstation that started it all, the M1, Korg have known the importance of a quality effects implementation. They've come a long way because, despite the budgetary restraints, the Microstation's effects are uniformly excellent. There are 134 algorithms to choose from, arrayed as five insert effects, two master effects and a total effect applied over everything. The total effect would typically be a master EQ or compressor and at least one of the master effects is an ideal candidate for reverb. Each sequencer track or combi part has individual sends to each master effect, leaving five insert effects for individual parts or tracks. Inserts can be chained in various combinations if necessary, adding up to a flexible enough system. Only the most basic effect parameters can be accessed on the Microstation itself, a further reminder about the difficulties of avoiding computer interaction. We have only sufficient space to cherry‑pick a few favourites amongst the effects here. Some of the modelled wah‑wah and phaser simulations took my fancy, in particular Envelope Phaser which, as its name suggests, sweeps the phase with an envelope rather than an LFO. The Polysix Ensemble effect brought back fuzzy memories of a favourite Korg analogue polysynth, while Auto Reverse was a zany delay intent on playing everything backwards. With delays in abundance, plus reverbs of up to 10 seconds, you can go deep, dark and ambient anytime you like. Specific effects parameters may be controlled in real time or automated via the sequencer. There are a number of double‑size effects too which, if used, reduce the overall number available. Interestingly, one of these is a vocoder — seemingly odd in a synth lacking any kind of audio input. But working with the built-in waveforms as both modulators and carriers proved to be entertaining, inspiring the old trick of generating rhythmic vocal‑type effects using a choir pad with a drum pattern acting as the modulator. Polished sounds at a tempting price. Editor software that runs stand‑alone or as a plug‑in. Generous polyphony and effects implementation. Doesn't feel as classy as it sounds (the display is small, the keys are small). The sequencer is a bit dated. A mini‑key workstation for the budget‑conscious, the Microstation is highly polyphonic, packed with Korg's signature sounds and combinations, yet light enough to pick up with one hand. Korg Brochure Line +44 (0)1908 857150. Korg USA +1 631 390 8737.